I posted a while back about the OSR, or (‘Old School Renaissance’), the revival of interest in late ’70s/early ’80s Dungeons & Dragons and other early roleplaying games. 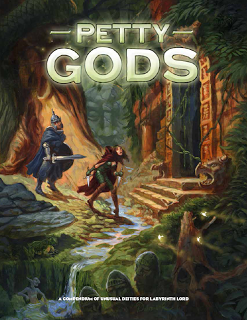 Inspired by the efforts of small publishers, and after reading James Maliszewski’s Grognardia blog, I contacted Maliszewski in October 2012 and offered to do the layout for a free community project he had worked on since November 2010: Petty Gods. Inspired by an old Judge’s Guild publication called Unknown Gods (and an idea by Blair Fitzpatrick of Planet Algol), Maliszewski had gathered together an impressive number of article submissions and illustrations. All he needed was a reliable graphic designer. Well, I spent a serious chunk of time laying out the 150 pages or so of text, images and tables, in an attempt to get the project out the door as soon as possible. All was going swimmingly until Maliszewski suddenly dropped out of contact. With everyone. Just about everyone in the OSR knows this story; Maliszewski experienced a personal tragedy and shut down all communication with the people he was collaborating with on various projects. Which personally was nothing more than a bit frustrating, but for many others there remained the matter of a Kickstarter project called Dwimmermount, almost 50K in funds, and a lot of unfulfilled promises. Several months have passed and most of these responsibilities have been taken off Maliszewski’s hands, who still hasn’t commented publically. I sympathise with how he has been affected by events in his personal life and wish him a better future. The Dwimmermount project has been kept alive by Autarch (his business partner in the Kickstarter campaign) who has doggedly acted with maturity and integrity. Anyway, back to Petty Gods. I heard not a thing, and thought the project was dead and my weeks of work wasted. And then the other day I stumbled across a blog called Gorgonmilk, where a fellow had got sick of waiting years for the book and decided to kick it off again afresh. At first I was taken aback and somewhat peeved, especially after he didn’t want to just finish what I’d done and make it available—and why should he, since no one had even known I had been working on it. But it turned out that Greg Gorgonmilk has far loftier ambitions—coupled with an infectious enthusiasm for the OSR and a generous and positive nature. So instead he suggested I finish off the existing book, make it available as Original Petty Gods (OPG), while he continued with the bigger Expanded Petty Gods (XPG), a project, I’m happy to say, which is getting bigger by the day and already has names such as Michael Moorcock and Gene Wolfe on board. Go for it Gorgonmilk! So, after another day’s work giving it a rough polish, that, as they say, is that, and if you’re interested, you now know the whole story. After two and a half years, you can finally get your hands on the ‘original’ version of Petty Gods and all the talented authors and artists who contributed to it for free finally get to see their work out in public. Let me know what you think! Happy International Tabletop Day! Chrissy Amphlett, R.I.P. Very cool, thanks for sharing. I really enjoy your work.